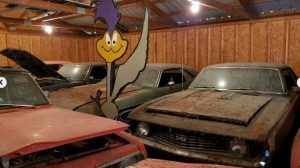 After a lifetime of devotion to the “Deer Lodge” in Louise, Canada this Canadian Barn Find has a charming appearance and possibilities. Last running in 2002, this “Jail Bar” Ford was parked in a barn until recently. Needing to be revived, this truck is relatively complete, and looks like it could be revived with a few weekends worth of work. With several days remaining, bidding has risen to $1,275. Take a look at it here on eBay out of Shelby, Montana. The Flathead currently has gone untouched since 2002, but this engine was reported as being an excellent runner. 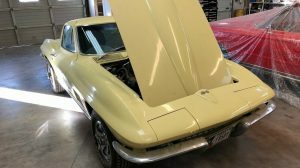 The seller claims they are going to investigate the engine and see if they can get it running before the auctions end. Looking to be complete, hopefully, the engine can be gently awakened and returned to a running condition once again. I would also bank on the fact that the brake and fuel systems will both need some work as well. Simple and “complete” the basic interior of this Ford is in fair shape with only surface rust on the floors to really gripe about. The bench looks to be original or recovered in a vintage material that looks the part. Both front windshields are cracked, so that will be another issue to contend with. There are some dings and bruises from this truck’s past, but overall the body has fared rather well. Both front fenders have a vast variety of small dents, and the driver rear fender has a sheet metal crease along with a few dents. 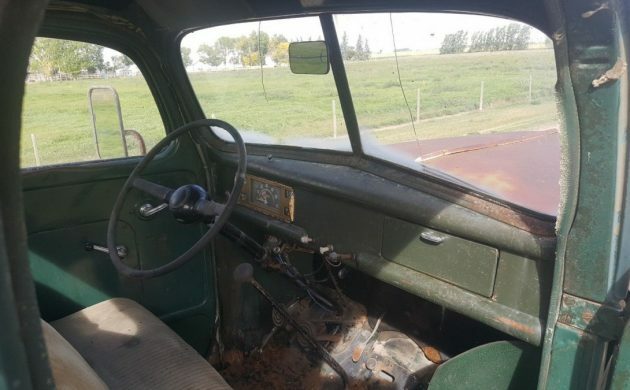 The cab is in decent shape with only minor rot on the driver side cab corner. The driver side of the bed is fairly solid, but the passenger side has some rot that could use some attention. Quite possibly the most important part of the truck is the “Jail Bar” grill that is missing a couple of slats, and the remaining slats suffer from some dents and dings. 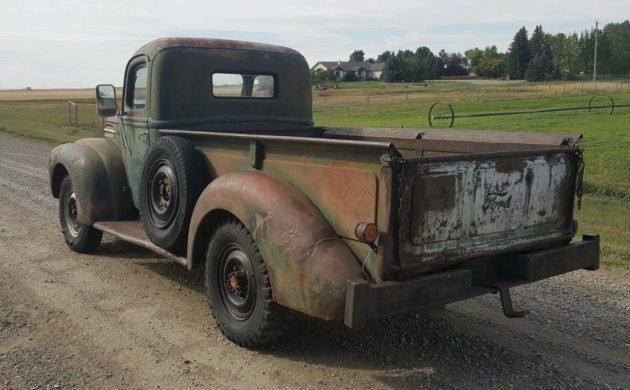 Would you invest the time into this old Ford? That would be Lake Louise Brian. Love the “Deer Lodge- Lake Louise” lettering on the doors. I’d really hate to paint over that. Bet that flathead would wake right up and purr. Thing about the older cars sitting a long time- they usually had worn rings, so the cylinders had some oil coating them- less likely to rust and seize. Haven’t heard that “jail bar” reference since I was living down in New Zealand. I always liked it. I’d hate to paint over the doors too. As I stated on another ford truck from a few weeks ago. Chocolate moose leather for the seats. Then wrap the chains in the same material on the tailgate. Take the mirrors off for a single post on the hinge. Then tastefully plug the holes on the door. Convert to a 12volt system with all new wires (cloth for period look). Rebuild the block with two carb setup with a street Thumpr cam for the brains of the beast. Do I need to go on? Never heard them referred to as “jail bars” before. Waterfall grille is a common term to describe this generation. JB Quite a common description. Also called a one and a half ton Ford. Tonners are getting more popular, possibly because the 1/2 ton pickups are well picked over. You can tell this one is a Canadian truck because the headlight rings are body color instead of cream. Interesting that there’s no heater–in a CDN truck. Not the original engine; this is at least an 8BA, which would’ve been installed in the ’48 tonners and everything from ’49 onward. Very late ’48 1/2 tons (CDN) had the 8BA but most of them used up the stock of 59AB engines, with the ’49s going the same way as the US. 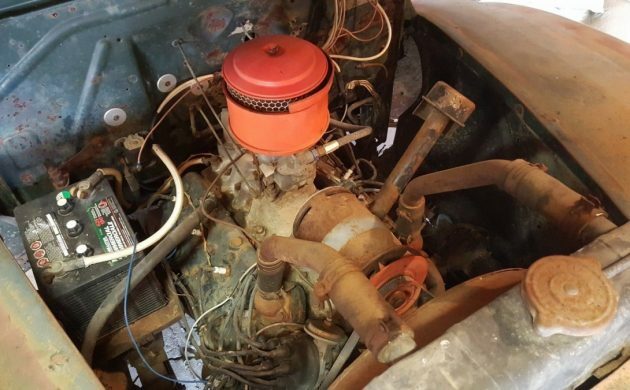 A Warner T-9 crashbox told everyone within earshot that a Ford flathead V8/4 spd. was in the neighborhood. They whined and wailed almost as bad as my ex-wife on payday (but I could handle one of these). I like this truck and would love to take it to my place, but I think I’d better draw the line where I am and let someone else take it. I’m sure they won’t be disappointed. Just the same, I’m going to be in Shelby tomorrow and I just might find time to see it up close and personal…. 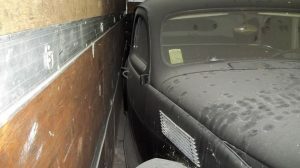 Thanks for commenting on our 47 Ford One Ton – I’ve noticed you comment on many of our old trucks. We’re based a bit north of the border but come across to Shelby on a weekly basis. Would be good to meet you if you’re in the area. This is just about as fine of a vintage Ford truck as I could hope to find. The last thing I would do is disturb that original finish and lettering. What a gem and I have no doubts about that flatty firing up and running. 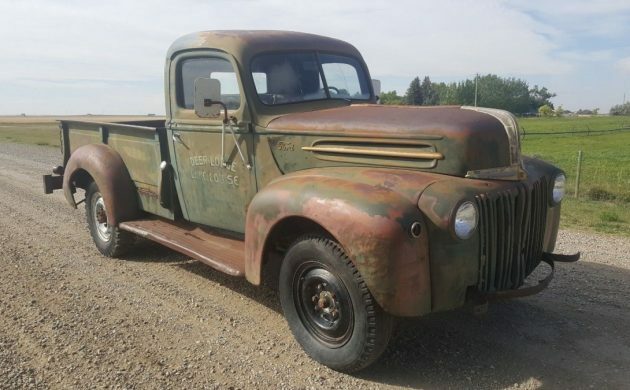 Once I finish up my current project I’m going on the hunt for a clean original 40s/50s pickup much like this sweetheart. 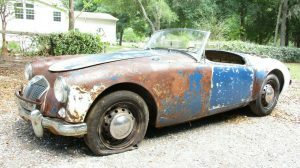 Going a bit further, I too am exhausted of the terms “patina” and or “barn find” regardless if the language applies. It’s really become unoriginal and stale. It would be nice if those words were bannished entirely from the vintage car/truck lexicon. I do however prefer a vintage/classic car that carries a nice weathered appearance in some cases like this wonderful Ford F2. Hahah, I somewhat agree, Chris. Excellent point! I do enjoy the site as it is name and all, just for the record! Ha! I’m currently the highest bidder. I truly want this truck. After I restored it. I want to take my Colombian wife for a ride up to Deer Lodge in Louise Canada for a second honeymoon. Just to be around where this truck spent its life. Wish me luck. I love green trucks! This would be my first flathead Ford. I hope I get to find out how my father spent his youth on olde fords and such. Thats outstanding Joe! Hope it goes to you. Glad to hear it’s someone winning with a good plan for the truck! Deer Lodge still operates and I have been in touch with them to let them know of the find – they’re going to see if they can find anything out about the history of it. It’d be a wonderful thing if you were to drive it up there and spend a few nights at the lodge! I would be truly floored if they turned up any photos of the truck from years past. Also any stories as well would be welcomed too. Thanks for the information David. That’s awesome Joe! I hope you get it. Hi Joe. I sure hope you get this truck. I’m sure you’all have a lot of fun with it. I’ve got a ‘47 1/2 ton that I’ve had for over 50 years now. I had a lot of fun with it and am looking forward to more good times. I like to know my vehicles’ history; to me it’s as good as the vehicles themselves. I’m the second owner of my truck; it was bought new in my hometown and I went to school with the original owners’ kids. I hope you get the truck. My wife and I spent part of our honeymoon in Lake Louise, and it is a beautiful place. I remember driving a one ton wrecker as a kid, and I also remember that there was a lot of transmission whine. Good luck Joe, I hope you know to wait until the last minutes to bid… avoid driving the price up prematurely! That is a really cool truck that deserves someone like you who really wants and will take good care of it! I have a 1946 1 1/2 ton which I bought because it is wider than the half ton but I don’t know if it is the same as a 1 ton. This one is a little straighter than mine but mine has no rust. I love the ford script on the hood and the jail bar grille. It looks so nonperformance I couldn’t resist it to put it on top of a late model turbo diesel chassis with drivetrain for an old truck that will drive like a new one. The wider body was very important. I have been told only the fenders are wider. Does anyone know this for fact? Actually the cabs on the Jailbar trucks date back to 1940. The fenders are bigger on the Tonner and larger trucks. I never measured them but I wonder if the only difference between the 1/2 ton and the others is the wheel openings. The heavy duty trucks had a spacer between the fender and the cowl and header to accommodate the wider track.